A cargo ship which sank in the Irish Sea off Gwynedd with the loss of six crew had been at the centre of repeated safety concerns, the BBC has learned. An analysis of safety inspection records for the Swanland reveals a high number of failings. Members of the crew claim the vessel was vulnerable in rough seas because of a history of unsafe loading. 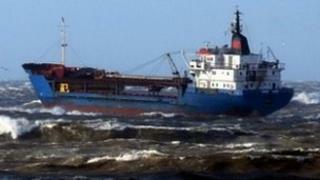 The ship's operator, Torbulk Limited, said it had been regularly inspected and any faults "promptly rectified". Investigations are continuing into what caused the merchant vessel to sink last month. Prince William co-piloted one of the helicopters involved in the rescue of two Russian crew members. The 34-year-old British-managed ship had a history of defects, according to safety inspections by the Maritime and Coastguard Agency. Over the past five years, 85 faults were highlighted - including cracks in the ship's decks and defective life-saving equipment identified in May this year. Marine safety management expert Dr Phil Anderson said that, even allowing for the ship's age, the number of defects seemed surprisingly high. "You wouldn't expect to see that number of deficiencies. It's quite serious. It could indicate a systemic breakdown of safety systems." Former crew members have also raised concerns about the techniques used to load the ship. Alexander Tsybin, a former Russian captain who worked on board the Swanland for 11 years, believes the vessel's hull had been weakened by the way the cargo was sometimes loaded to save time on each voyage. Instead of loading evenly from either end, it would be deposited in the middle. "While the ship was being loaded, it would cave in a little, and while it was being unloaded, it would bulge out," he said. "So the middle of the ship would always be subject to pressure which meant that in the end it became weakened." Maritime safety experts have also told the BBC that loading heavy, unsecured cargo into a single hull could cause displacement which might cause a ship to roll in bad weather. They say the combination of the crew's concerns about loading and the historical defects involving structural safety and cracked decks "give rise for concern". The vessel was caught in a gale force 8 storm off the Lleyn Peninsula, north Wales, at the end of November. According to Vitaliy Karpenko, one of the two survivors from the all-Russian crew, the ship's hull suddenly cracked. Image caption Six crewmen lost their lives when the Swanland sank off the coast of Wales. Got a story that needs investigating? "It broke in half right across the middle. I saw it with my own eyes," he said. "We saw through the porthole that it was hopeless trying to save her." The ship's Grimsby-based operator Torbulk Shipping said in a statement that it understood the vessel was loaded in accordance with good practice, adding: "Any working sea-going cargo vessel... will be inspected on a regular basis and may incur minor deficiencies. "These deficiencies are required to be promptly rectified or the vessel would not be permitted to trade. "We are unable to comment on specific instances. However, we can state that any deficiencies identified are always rectified within the time-scale specified [by the authorities]." The vessel, which was British-owned, was flagged to the tiny Cook Islands in the Pacific. The islands have a higher number of ships with safety problems, and the international shipping authorities regard their flag as inferior to those from European maritime regulators. The Maritime Accident Investigation Branch is currently carrying out an investigation into the cause of the accident. You can hear the full report on 5 live Investigates on Sunday 11 December at 21:00 GMT on BBC Radio 5 live. You can also listen via the 5 live website or by downloading the 5 live Investigates podcast.